Based on everyone's feedback so far regarding the installation of MAT, we hope this thread will help anyone that are having installation problems. When running the installer, I immediately get an Error in unknown symbols and characters. The download has not completed or has erroneously been reported as completed. Under Windows explorer, check the file-size of the installer (in Bytes). To do this, right-click the file and select Properties. Under the "Size:" field, the correct value must be exactly as listed below for your file name. In some browsers, you can resume the download by using the download management pages. Alternatively, you can redownload the installer from the beginning. When running the installer, while the installer is copying files, I get an Error indicating that some files are corrupt. The download has completed but some parts of the installer are corrupt. You do not need to confirm this. This error message is very specific and is only displayed when the current file does not match predefined file integrity information for the current file. If you really want to check for sure, you can take a checksum of your installer .exe file. A checksum is a number that helps in determining the integrity of the file. The algorithm in calculating the checksum is designed such that a change in the file will usually cause a different checksum to be calculated. CRC32 and MD5 checksums are not built into Windows. But there are applications for Windows that can make obtaining the checksum of a file easier. Although you may be tempted to click "Ignore," we highly recommend against it. The reason is that corrupt game files will likely cause game anomalies later. Potentially leading to other "weird bugs" that should not normally occur. 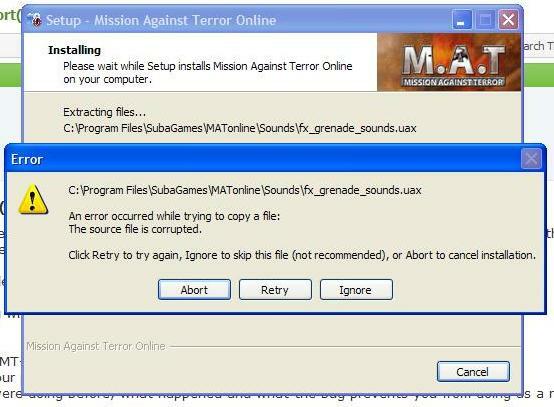 The server may also disconnect players possessing non-standard files. The best solution is to redownload the installer from another source. If you experience any other errors while installing, please post a picture and we will add any additional information we know. Good idea to organise Everything into one thread, this may save people search time later on. thank you for this. really helped. Can we get a sticky please?